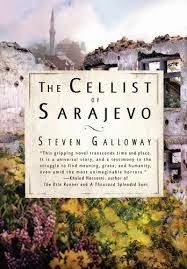 a book chick: "The Cellist of Sarajevo"
my take: This is a quick and excellent read ... although it's about WAR so it's not entirely easy. It's based on true events during the civil war in Bosnia. After a mass killing, the local cellist played Albonini's Adagio every afternoon for 22 days to honor and remember the people killed while waiting in line for bread. The opening chapter is from the perspective of the cellist, the rest of the story is told through three other narrators ... all inside the besieged city. Through their eyes and voices the reader catches a glimpse of a glorious city laying in ruins and the fear, pain, and dilemmas of war. A good discussion book and a good read. A thought that haunted me was how one character was certain the world would surely come to the aid of those trapped in that decimated city. It makes me wonder if people in Syria (and other war forsaken places) are saying the same thing. Hmm, I think Bosnia would be on that India/Russia type location list... but this sounds good! Interesting when discussions can parallel/help you understand current events too.